Let's Do It for ME! : Help Invest in ME Help You! Help Invest in ME Help You! Invest in ME plan to open a centre of excellence for ME in the UK, the first of its kind in Europe. In order to achieve their goal of opening this ambitious research and treatment centre, £100,000 needs to be raised. Let's do it for ME! is a campaign run by sufferers, in cooperation with Invest in ME, to ensure this much needed funding is raised for the centre. The centre will use the correct and up-to-date diagnostic criteria and will work in cooperation with international researchers. Please donate whatever you can. 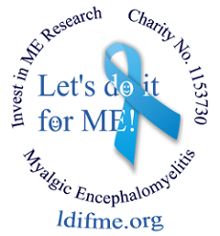 There are over 1600 members of Invest In ME's Facebook group, if 1000 of these members each raised £100 we'd be there! Donate to Let's do it for ME! via Everyclick. You do not need to sign up to donate, simply click the green 'Give now' button on our fundraising page and then select 'Donate'. If you prefer to use PayPal, you can donate via Invest in ME's biomedical research fund here by adding “centre” in the additional comments section just before you confirm your donation. You can also send cheques made payable to Invest in ME to Invest in ME, PO Box 561, Eastleigh, SO50 0GQ, Hampshire, UK. Write "for the centre" on the back to let them know what your donation is for. You can add gift aid to you donation using Invest in ME's gift aid form. Strapped for cash? No problem, we have a way for those in the UK to raise funds for FREE. Sign up to Everyclick.com and start to Give As You Live™ in support of Let's do it for ME! We particularly encourage those who shop regularly online and grocery shop online to do this. Unfortunately, it is a UK based application for UK charities and stores only. Stores taking part in this scheme include Asda, Marks & Spencer, Sainsbury's, Tesco and Waitrose. The full list of stores is very wide and varied including many clothing stores, DIY stores, home and garden stores, electrical stores, travel agents and health and beauty stores. You can view and search the list here. Go to http://www.everyclick.com/ and click 'Sign In', then select 'Sign Up'. You need to search for and choose a charity to support to begin the sign up process. You can't choose Let's Do It For ME! as your cause at this point as you need to be fully signed up before you can view and select our page. Search for and select Invest in ME then press continue. Fill in your personal details and press finish to create your account. You will then be redirected to your account page. Search for a fundraising page? Select this option and 'Confirm change'. Your Account page will now say 'I am supporting: Let's do it for ME!' and the sign-up process is complete. Next, download Everyclick's Give As You Live™ application here. For more information on how the Give As You Live™ application works see How does Give As You Live™ work? Let's do it for ME! works closely with, and is supported by, Invest in ME. All donations go directly to them and towards the UK centre, see our campaign highlighted on their website here and here. Announcement - Matched Donation Period!